We have a winner! Congratulations to Abigail who commented, “I love the Two Initial Open Rings!” and thank you to everyone who entered. I hope everyone had a lovely Turkey Day! Happy Friday everyone! It’s been a long time since I posted anything fashion oriented. Let’s be honest there are times when you aren’t feeling very fashionable. 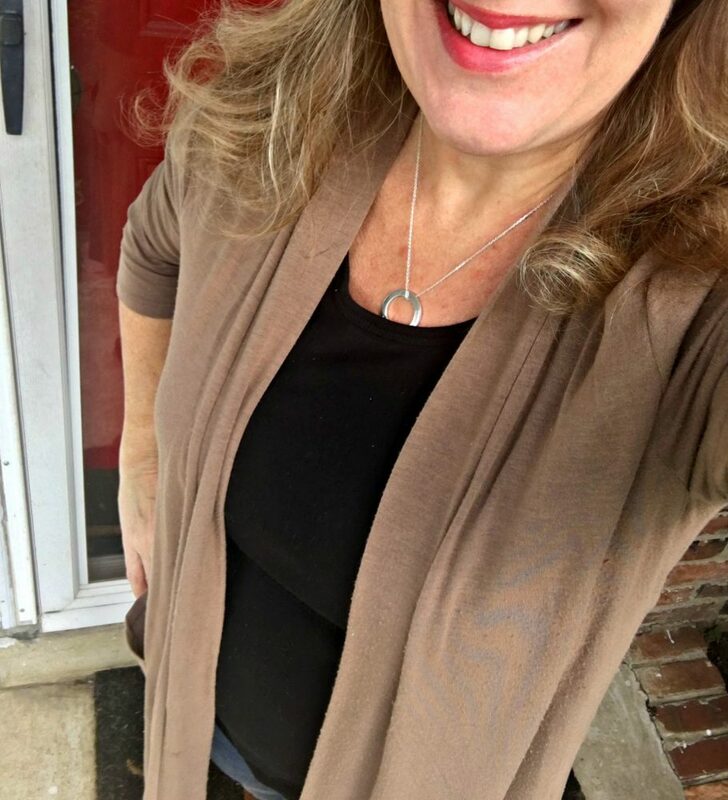 However, mama’s getting her groove back and now that I’m working from home full time with my own business I am finding that I have somewhat of a “busy working mom outfit.” This typically consists of jeans, a comfy tee and some sort of cardigan for layering. And let’s not forget boots now that it’s finally fall! 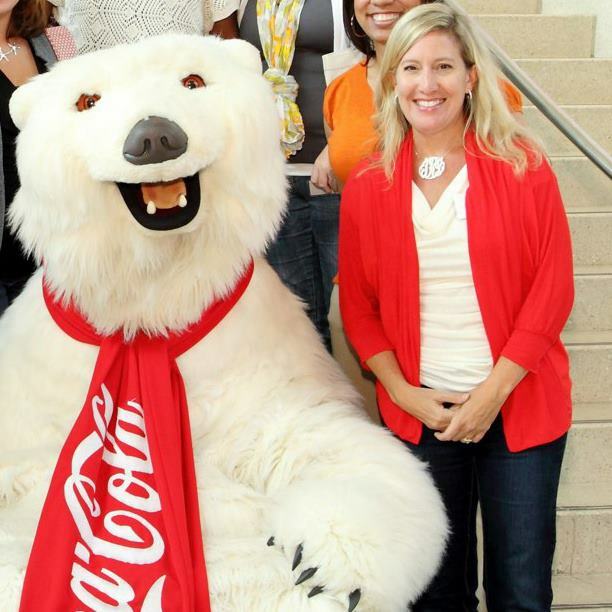 If I have an event or client meeting of course I usually step it up a notch. Working remotely doesn’t mean yoga pants all day every day although that is tempting. 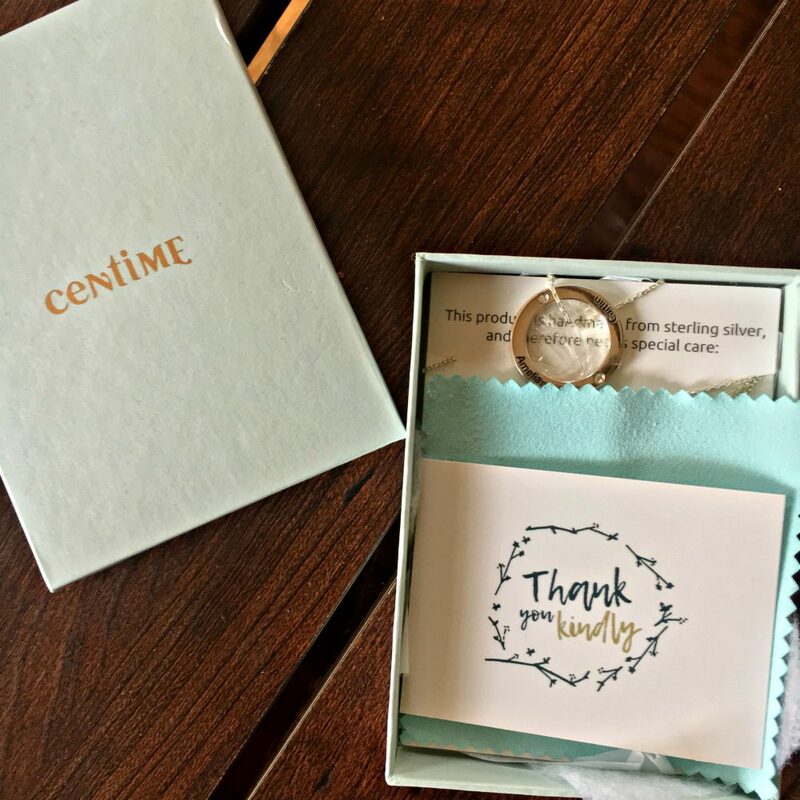 As a mom of teens it’s been a while since “mom jewelry” of any style caught my eye but I was contacted a few weeks ago by Centime to review one of their personalized pieces. I love that this silver finish necklace doesn’t scream mom, but subtly has my girls’ names engraved on it. It looks great as everyday jewelry and keeps my girls close to my heart. Even though they are both teenagers now and there are days when laundry becomes a bargaining chip for warfare at the house. You can check out all of their personalized mother necklaces online. Their site is easy to navigate and I love that you can choose from different finishes. Maybe you’re not loving silver? They have gold and rose gold as well! I also LOVE their monogram jewelry (after all I am a Southern girl at heart) and their block monogram necklaces especially. I have it in gold and I’ve already received multiple compliments on it! The holidays will be here before you know it, and personalized jewelry is always a great choice whether you have kids or not! Centime products arrive beautifully packaged as well. Now for some fun news. I’ve partnered with Centime to give one lucky reader of my blog a $70 gift code! To enter, please leave a comment below letting me know what product(s) you wish to receive from Centime Gift. For an additional entry, please head over to my Instagram feed and like my account. And if you really want to be my BFF for the day, I’d love for you to let me know if you are a fan of my Facebook page. Want to save 20% on a purchase a Centime? Use the code 20JAMIE at checkout. I’ll select a random winner from all eligible comments left by midnight Thursday, November 15. Thanks for entering and good luck! This entry was posted in Fashion Friday, Reviews & Giveaways and tagged #FashionFriday, centime, custom jewelry, gifts for her, giveaway, holiday gifts, jewelry. I remember one of your early posts featuring the initial necklace and I wanted one – I’m loving this look as well! I like the gold circle…so pretty. So many great options! I see several things I would love for myself as well as some great gift ideas for my mom. Love the circle one in your pic! I like the Disc Handwriting Necklace – Premium Oversize but I like the necklaces with the rings for my children’s names. I liked you on Instagram as savvyblog1. I’m a fan on Facebook as Sherri Sav. I like the family name necklace for grandmother. I would love to get the personal handwriting necklace large with a note from my brother. Ive been looking for the perfect memorial item to gift my stepmother in honor of my little brother and something like that would be just perfect. Instagram is underscore underscore sillysarah but the underscores don’t want to play along in the comment box. Moms signature.. she had beautiful handwriting but passed away in 2014. Their jewelry is just so pretty. One I like is the Double Initials Ring with Diamond Heart. I would love to have something that has some meaning for me and my wonderful fiance’. I am already a follower on IG @tatzgrrly and a longtime FB fan~ Dana Rodriguez. I’ve been looking for a circle necklace and this would be perfect! Also follow you on Instagram and FB fan! Love the infinity coordinate necklace. I’d get my family’s cabin coordinates. I’d love to have a slim coordinate ring! I really like the mother necklace with kids names. I follow on Facebook and Instagram. Love the Mothers necklace with kids names and the grandmother one with grands names. I wish to receive the Personalized Handwritten Bracelet with Birthstone Charm. I love the handwriting bracelet! I love quite a few of their items, especially the bracelets that I could fit all 5 of my kids’ names on & even my grandson’s name on too, on some of them! However, if I am blessed enough to win, “I” am not going to choose MY favorite, because it would be a gift for our daughter Michae’la and I know she would choose one of the pieces regarding being a mom to her son (and our only grandson), Ashton, as he is her heart, soul, and world! I would want her to be able to choose her own favorite piece. I do know she would choose the silver. Thank you for this chance. I follow both you & @centimegifts on Instagram as @yvonnewoodstock. Also, I loved & commented on your Instagram photo of this giveaway/jewelry at https://www.instagram.com/centimegift/ as @yvonnewoodstock. I feel that is one of the so much vital information for me.And i’m satisfied reading your article . The personalized handwriting necklace looks like a wonderful gift. They have a very nice selection. This was really had to chose just one. I will say that I do like the Children’s Initial Necklace for Moms. I would love the Children’s Names Necklace For Mother – Circle of Love. There are so many beautiful pieces! I like the 3 sisters necklaces. I love the children’s name necklace. I would love the Mother’s Necklace with Kids’ Names – 4 Rings, I would put my 2 kids and my 2 grandkids on it. I love the Two Initial Open Rings! I love the handwriting ring and the mom and child circle necklace. So sweet. Mother’s Necklace with Kids’ Names – 3 Rings !! I think I would go with the classic gold necklace with my daughters names on it. These are so cute and would make perfect Christmas gifts. I really like the Mother’s Necklace with Kids’ Names – 5 Rings. I follow you on instagram as helenb0725. I like you on facebook as Helen Bishop. I would really like a monagramed piece! I’d like to get the Circle of Love necklace. I would love to get my mom the grandmother birthstone necklace. I would love to get the Mother-Daughter Heart Necklace (Set of 2)! This would be perfect to share with my daughter for Christmas! I follow on facebook as Lissa Crane! There’s so many different options to consider…I like the Oval Fingerprint NEcklace the best. I would love to get Elise the small silver monogram necklace. It’s a classic! I love the Mommy Bracelet – Infinity Charm. Its so pretty and personal. Thank you for sharing! Liked your facebook page, thank you, would love to win. I’d love to get the Children’s Names Necklace For Mother – Circle of Love, and the Infinity necklace!